Charles Dwyer was born in West Bend, Wisconsin in 1961 and graduated Valedictorian from Milwaukee School of Art & Design in 1984. When an artist is truly talented, you look at the training and academic background, you look at their collector lists. You study their style to see who may have influenced them. Classic artists start by learning how to draw, you cannot proceed with any area of art until you master the skill of drawing. 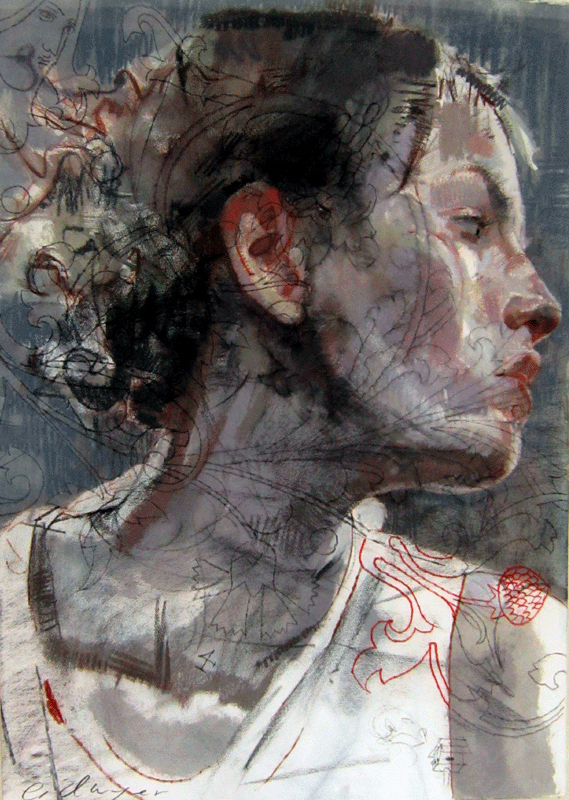 Charles Dwyer has mastered drawing and painting the female figure. Best known for doing mixed media works on paper and canvas, layered with symbols, designs and abstract diversions, his work exhibits more depth and complexity than any modern figure artist. His signature style is classical and will hold the test of time. It resides in major art collections both private, public and corporate not only in the United States but throughout the world in Munich and Barcelona to name just two. Dwyer’s involvement in conservation and restoration of historical landmarks and churches across the U.S. may be the source of the layering media and meanings that appears as a recurring theme in his art. It continuously exposes him to the techniques and intentions of long gone artists. As part of his work in conservation and restoration , Charles Dwyer has recreated murals in various landmark buildings, restored decorative murals and stained glass designs, yet his true passion remains in his own work. Fascinated by the complexities of both the human form and the human mind, Dwyer finds inspiration for his art in the simplicity of the face, and expands on that in his love for doing portraiture. He uses mixed media to create images with both literal and figurative layers. Skilled in many areas of the creative process, drawing however remains closest to his heart. 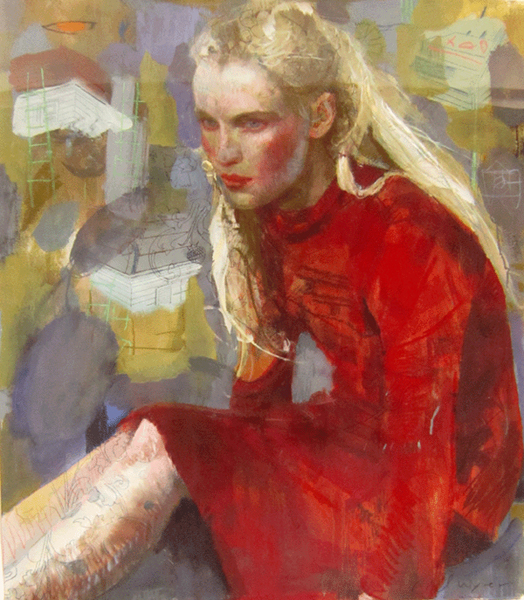 “Drawing is the foundation of everything, Charles Dwyer declares. “It’s kind of primal.” Much of his inspiration comes from photographs he takes of people, both anonymous and familial. For him, photography is a critical part of his artistic process. Also, it was during his studies in college he “fell in love” with the print making process of etching and stone lithography. Dwyer can now move into something he has longed to do… the 3-dimensional form of the female figure in sculpture giving the expanse of his work full circle and in perfect timing for the peaking of his artistic journey. Please review the following Charles Dwyer art for sale. 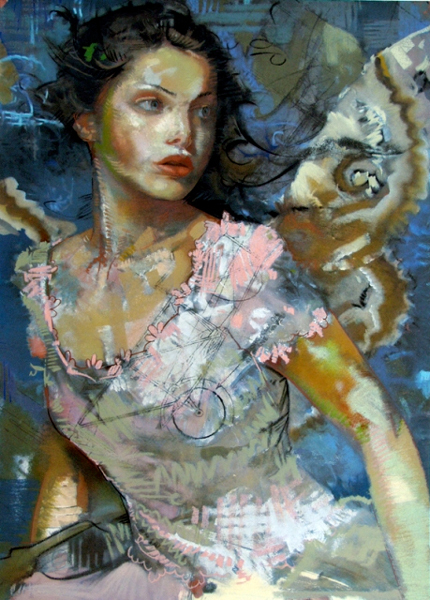 This entry was posted in Expressionists and tagged art for sale, Charles Dwyer, Expressionists. Bookmark the permalink.